Injuries hampered Robbie Hummel as he played in only 98 games over two NBA seasons. Approximately 25 percent of all sports injuries involve the hand or wrist, and basketball players are particularly susceptible. 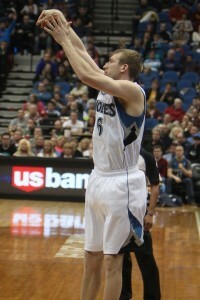 Former Minnesota Timberwolves small forward Robbie Hummel and Cavaliers forward Kevin Love are two of the many professional basketball players who have experienced hand injuries in their careers. Whether you’re an aspiring professional or strictly a recreational player, it’s important to know how to protect your hands and wrists. Read on to learn some important tips and tricks that can help players of all ages and skill levels prevent hand and wrist injuries. Jammed fingers — this is most common hand injury to occur in basketball. The finger gets “jammed” when the ball hits the tip of the finger instead of the palm of the hand. Finger jams can lead to more serious injuries, like sprains of the finger ligaments, dislocations, or fractures. Wrist sprains — these occur when a ligament gets stretched or torn, usually as a result of the wrist being forcefully bent, or if the player falls down onto an outstretched hand. When the ligament is just stretched, it is considered a mild sprain. More severe sprains occur when the ligament is partially or totally torn. Wrist fractures — wrist fractures occur when one or more of the bones in the wrist is broken. Forceful bending can cause fractures, as can falling onto an outstretched hand. Finger/hand fractures — the bones in the fingers and hands are also susceptible to fractures. Even small breaks can totally put the hand out of commission and make simple tasks incredibly painful and difficult. Finger and hand fractures often occur when the ball is caught, when a player runs into another player, or during falls. These are just like traditional push-ups, except your weight is supported on your fingertips rather than your palms. These push-ups build wrist and finger dexterity and strengthen the wrists. Using a weighted basketball during practice helps improve your wrist and forearm strength and will improve your shooting range and ability to properly release the ball. This exercise is great for wrist strength, dexterity, and flexibility. To do it, extend your arms in front of you and bend your elbows at 90-degrees. Then, keeping your elbows and forearms stationary, move your wrists back and forth as though you’re waving goodbye. Using a weighted jump rope is another good option for strengthening your wrists and forearms. This will make your hands quicker and more resilient to injuries. The weight should be heavy enough to tire you out in about one minute. In the event that you do experience a hand or wrist injury, it’s important to be proactive in treating it (even if you think it’s a mild injury). This will help you get back in the game faster and avoid future injuries and complications. In most cases, these measures are effective for treating hand and wrist injuries. In some cases, though, surgery and/or physical therapy may be necessary. Hand and wrist injuries aren’t totally preventable in basketball (or any sport, for that matter). But, you can significantly decrease your risk of experiencing one by keeping these prevention tips in mind. You can also implement these tips in the event that you do injure your hand to speed up the healing process and get back in the game faster.